PDR Network is an independent organization that is used by Medical Doctors as a reference to drugs or medicines. 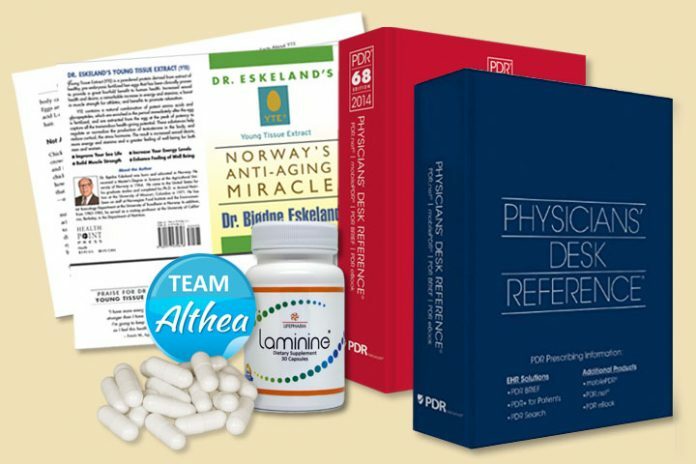 PDR Network is the leading distributor of drug labeling information, product safety Alerts, and REMS programs include the Physicians’ Desk Reference® (PDR®). It also includes information on dosages, side effects, and safety information. Data on clinical trials are also included. Laminine Food Supplement is listed with PDR.net in October 2014, 2016, and 2017. PDR has been the authoritative source on prescription drugs for 68 years. It contains full, FDA-approved drug label information, including warnings and precautions, drug interactions. Laminine can now safely be prescribed by Doctors & Physicians. OPT9 Proprietary Blend at 620 mg. The proprietary formula in Laminine is called OPT9™. This formula is composed of three (3) ingredients: Fertilized Avian Egg Extract (FAEE), Phyto Proteins, and Marine Proteins. Other Ingredients: Laminine contains inactive carriers: Vegetable Capsule, Silicon Dioxide, and Magnesium Stearate. Laminine contains the proprietary process of fertilized avian egg extract, along with a blend of marine and Phyto proteins added to make it unique with all essential amino acids. The health benefits of the hen egg have been known for centuries. Investigation of the mechanism of the development of an egg after fertilization revealed certain health benefits. In earlier studies, whilst monitoring weight gain of the egg during their development, scientists (1) found very little gain in the first 9-10 days (7.5%), and then a sharp increase (1190% by day 23), suggesting the rapid development of a body. The potency of the nutrients available to the fertilized avian egg at this stage has always been assumed to be high, but it was only recently that the chemical structure of the original egg solids for these critical stages, termed blastodermal to protoembryoinic stages was obtained. During the blastodermal to proto embryo nic stages of embryogenesis, oligopeptides with molecular weights from 0.5 to 1.0 kD were identified. Oligopeptides are compounds, which have 2 to 20 amino acids joined by a peptide bond. These short chains of amino acids are able to cross the digestive barrier without breaking down or changing the ratios and proportions (2). Peptides are far more potent than other neurotransmitters, requiring only small amounts to produce a profound effect. Additionally, the uptake of the Fibroblast Growth Factor (FGF) (present in the protoembryonic fluid) and other bioactive peptides by the developing avian egg sharply increases between days 11 & 12. These peptides and the FGF have been isolated through a proprietary process precisely at the right stage of development, using a proprietary drying technique to bring the health benefits to humans. The extract is termed Fertilized Avian Egg Extract (FAEE). In 1929, John R. Davidson, a Canadian Doctor, discovered an extract derived from fertilized avian eggs when they were at a critical stage of development. He used this extract to restore health in his patients. Dr. Davidson spent well over a decade developing and researching his theory. However, when Dr. Davidson passed away in 1943, his research on fertilized avian eggs was not passed on and was soon forgotten. Nearly 50 years later, the pursuit of fertilized avian egg extract was revived by Norway’s foremost expert on egg research: Dr. Bjoedne Eskeland. He took Dr. Davidson’s original research a step further and hypothesized that fertilized avian eggs contained a special combination of amino acids, peptides and protein fractions that could help provide an incredible array of health benefits when consumed by humans. This included vitamins, minerals, and proteins, as well as important defense elements, growth factors, hormones and other biologically active components. The bioactive peptides in Laminine stimulate the dormant stem cells to utilize the Phyto amino acids and marine protein to repair damaged aged cells. Drying the protoembryonic fluid before the peptides are “used up” to build organs and bones, allows us to provide this building, repairing, maintenance mechanism of perfectly balanced amino acids, peptides and growth factors to humans. Nature has devised an extremely versatile mechanism to provide nutrition with miraculous precision to the embryo of living creatures. The precise blend of oligopeptides may be seen as building blocks, without a bridge, or a director. The role of such a director is fulfilled by a growth factor known as the Fibroblast Growth Factor, or FGF, also a bioactive peptide. FGF is prolific in protoembryonic liquid as well as the human placenta. On the 11th day of the incubation cycle of a chicken egg, the chicken tissue shows a steep increase in these bioactive peptides, with the appropriate peptides to form the solid organs and bones (3). A detailed day-by-day study was performed in 1988 (5; 7). Discovered only in the seventies, FGF and bioactive peptides are critical in the development of embryos, including humans. Bioactive peptides are responsible for building the linings in the blood vessels, creating the infrastructure for the nutrients to flow to critical areas of the brain and organs. Research credits bioactive peptides with the potential to directly affect many neuro disorders because of clear results of the ability of bioactive peptides to affect the growth of neurites (4). Neurites are signal senders (Axons) and signal receivers (dendrites) attached to the brain neurons. The beneficial impacts of Laminine are: positive effects on memory, skin, libido, energy, joints, muscles, stress, sleep and emotional stability. Click here for known side effects of Laminine. In a 1997 study, immediately following surgery, (animal) subjects were randomized to receive either an amino acid diet or a peptide diet for 10 days and the strength of the wound was measured. Wound bursting pressure was found to be significantly higher in subjects receiving the peptide diets than in those just receiving amino acid diets. The authors suggest that dietary peptides may stimulate the production of growth factors such as growth hormone, insulin, or insulin growth factor (IGF-1). They also postulate that it is possible that the amino acid entry into the cell via peptide transporters is more efficient for stimulation of protein synthesis than an entry in the form of just amino acids. Other possible mechanisms suggested by the authors for the increased wound healing with peptide versus non-peptide diets include stimulation of collagen synthesis, increased blood flow to the wound, free radical scavenging, and generation of cytokine profiles which better support wound healing. This study was designed to ascertain the effect of the nutritional supplement, Laminine on cortisol levels in the body. During the experiment, 28 subjects, 16 women and 12 men, between the ages of 36 and 83 took part in the study. Salivary cortisol level content of each participant was measured prior to him/her taking part in the study. This figure is known as “pre-Laminine usage level.” The salivary cortisol level was also measured every fifth day three times throughout the study when each participant’s intake amount was changed. Overall, study participants’ cortisol levels were reduced by an average of 23.7 percent, where 16 started on a higher intake of Laminine—four capsules, twice a day—and 12 started on one capsule twice per day. Participants that initially started on a higher intake of Laminine saw their cortisol level reduced significantly over the first four days as compared to subjects that began the study with a lower usage amount. However, at the end of the study, there was a small, although insignificant, a difference in favor of the high initial intake. The total cortisol reduction by the end of the study was 27.3 percent in women and 19.2 percent in men. The study took place during two phases. The first lasted eight weeks and included Groups A, B, and C. Cholesterol serum profiles and blood pressure were taken from participants in each group at the start of week one and at the conclusion of week eight. During this phase of the study, participants took a total of four supplements a day—two in the morning and two in the evening. The second phase of the study only included participants from Group A and lasted an additional four weeks, after which time cholesterol serum profiles were measured again. 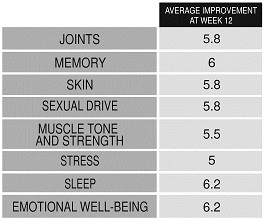 During phase II, participants in Group A consumed eight supplements a day—four in the morning and four in the evening. During the first phase of the study, results showed that the average cholesterol drop in Group B was about 9.8 percent, compared to 11.5 percent in Group C. Meanwhile, cholesterol levels in Group A actually increased by 1.0 percent over the first eight weeks but dropped by 12 percent between weeks eight and 12. 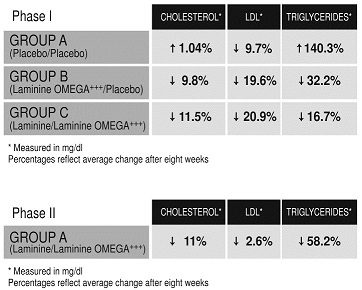 Results for LDL and triglycerides generally followed a similar pattern. Triglyceride levels in Group A dropped by 267 mg/dl or 58.2 percent during Phase II, the most substantial change throughout the duration of the study. However, participants in Group C experienced the best and most consistent overall results. HDL levels were within normal limits both at the beginning and end of the study for all participants. Although participants in Group A took double the Laminine and Laminine OMEGA+++ during Phase II, results were not drastic enough to recommend doubling the suggested usage for Laminine OMEGA+++ for all individuals. The decrease in LDL was not significant in Group A during Phase II as compared to Group C during Phase I. Nevertheless, for individuals that do have high triglycerides, doubling the intake of Laminine and Laminine OMEGA+++ can yield a drastic improvement in a short period of time. From these data, we can conclude that Laminine OMEGA+++ helps to lower cholesterol, LDL and triglyceride and blood pressure levels (Group B), but when taken with Laminine, the decreases are more significant as a whole (Group C after Phase I and Group A after Phase II). Roberts, Pamela R, et al. Nutrition Vol. 14, No. 3, 1998. I was reading a negative comment on Dr sukala and believed him until I read this clinical study. Thank you. I am releaved now when a colleague told me it worked and helped her recover.